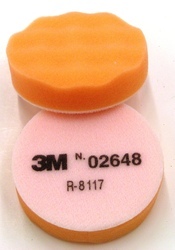 This orange foam buffing pad has a waffle face which provides efficient finishing action. Designed to be used in the Finesse-it™ Trizact™ Paint Repair System for AOEM clear coats. Has Hookit™ attachment system (white loop). 3-1/4 in dia.